Aimee Meredith Cox is a cultural anthropologist and tenured professor of performance and African and African American studies at Fordham University. Her first book is Shapeshifters: Black Girls and the Choreography of Citizenship (Duke University Press, 2015). She is on the editorial board of The Feminist Wire and the founding editorial board of Public: A Journal of Imagining America. Cox is a former professional dancer who studied on scholarship at the Dance Theatre of Harlem and toured widely with Ailey II/The Alvin Ailey Repertory Ensemble. She is also the founder of BlackLight, a young women of color-led activist art initiative that produced community-based projects in Detroit, Newark, and New York City. Starting in the late summer of 2014, we have witnessed what some are calling a new form of protest staged by an intergenerational and interracial populace intent on challenging the status quo of state violence in the United States. The visual of large numbers of bodies in the streets with megaphones and signs, chanting slogans and demanding answers and retribution is not new. And yet, there is something about this moment of protest and the activism it represents that calls us to reconsider not only how policing occurs, but how young people, in particular, understand their relationship to the state. Social media platforms allow millennial activists to organize protests within minutes. The rapidity with which the circulation of information can be both disseminated and critiqued made the image of Michael Brown’s eighteen-year-old body laying for over four hours in the middle of the street where he was fatally shot the lightening rod catalyst for a national movement. Although the ability to see murdered bodies minutes after they have fallen, to hear audio of the victims and perpetrators seconds before their encounter, and to mobilize as soon as the online call is made, allows the killing of Michael Brown, Trayvon Martin, and Eric Garner to become spectacular events, the specter of violence leveled by the state is all too mundane for many young Black people living in the United States. 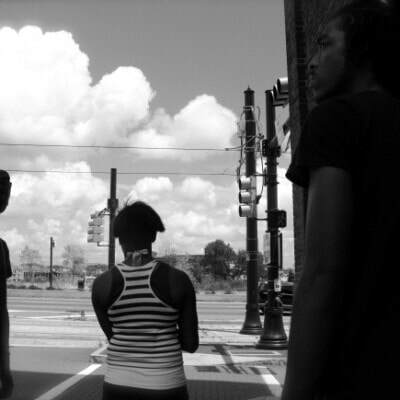 If you have minimal to no interaction with young Black men and women living in cities like Sanford or Ferguson or Detroit or Newark, it can be easy to assume that the prospect of being killed in one’s own neighborhood or that the ways in which Black youth respond to this ever present and all too real possibility are anomalies. Photographs and video footage have captured young Black women, many of whom are in their late teens and early twenties, on the front lines of protests and mobilizing their communities by leading teach-ins among other efforts. While the leadership of young Black women gains a certain level of mainstream visibility, this new focus belies the fact that young Black women have historically been at the forefront of activities and the initiators of conversations meant to protect the interests and lives of everyone who claims membership in their communities. My ethnographic research on race, gender, and citizenship in the U.S. has largely focused on the ways in which young people of color manage their lives in under-resourced but overly policed environments. In over a decade of research with young Black women in Detroit and high school-age Black girls in Newark, I have seen how young women take strategic action to protect their cities and the people who call these cities home, even as these same local spaces and residents do not always protect them. For example, the young women residents of a homeless shelter in Detroit confronted issues such as the crisis in public education, the lack of safe and reliable public transportation, and corruption in the city and state government with community-based workshops and street theater events that provided new forums for Detroiters to identify possible ways to address the most potentially debilitating challenges to the vitality and cohesion of their community. In Newark, high-school-age girls, concerned about the dangers they encountered traveling to and from school and work, interviewed other Black girls and women to explore their relationships to the city. The transcripts from the interviews then became the foundation for a performance project that detailed how the intersection of race, gender, age, and class influenced the ways in which Black women enact community and move through the city through a conscious choreography that provided their individual bodies and the bodies of the larger collective with the ability to experience the urban environment as more than stress, threat, aggression, or violence. In both Detroit and Newark, the young women at the center of these creative political initiatives openly expressed their desire to re-narrate racialized neighborhoods that have been marked in the media as areas of crime and destitution, or as “homespaces” where an ethos of civic accountability and genuine care are more real and felt than the acts of spectacular violence with which these geographic locations are generally associated. In November of 2014, I traveled to Missouri to give thanks for the thoughtfully courageous work of the young activists who were active in their communities long before anyone beyond their local borders had heard of a town called Ferguson or the tragic death of a young man named Mike Brown. There, too, young Black women talked about the projects they have been spearheading for years to support and educate their neighbors—projects that will continue well after the names of recently murdered youth have dropped out of popular conversations and moved to the growing archive of young Black men and women killed under the guise of safety and protection. The linear and ahistorical narrative of Black activism and protest in the United States is obsessed with identifying singular, usually male, leaders responsible for inspiring collective action. A more rigorous and accurate retelling of history, however, points to the actions taken by Black women, many of them young women, that established the foundation that supported the highly visible events embedded in the popular consciousness as “our protest history.” Our protest history shaped our active present, and will inevitably transform how we understand the potential for future steps toward greater equity and justice. The way we discuss the past, understand the present, and plan for the future of social transformation must be grounded in recognition of young Black women’s every day choreography of survival—the quotidian practices that make the spectacular movements we actually allow ourselves to see. “You don’t have to show us how to love. We already know how.” Tanya met my gaze for what felt like a little longer than forever. She reached down to turn the sound back up on the YouTube video, plopped down on the thinning carpet and resumed writing in her notebook. Tanya, at the age of twenty-one, was one of the oldest in the group of shelter residents who had been gathering twice a week to write, dance, choreograph, and read Audre Lorde, James Baldwin, and one another’s original poetry, plays, and short stories over the past seven months in the open space of the shelter’s activity room. “Of course you do, Tanya; that’s not what I meant,” I said, and tried to convince myself that my weak response was due to exhaustion and not the shock of a truth spoken in a way that made my motives seem, at the very least, questionable. It was late summer and the three young women working in the warm and muggy activity room on that day were part of BlackLight, a loose collective of anywhere from three to ten shelter residents who used their time away from school, retail jobs, and job training programs to create performance art. The words they wrote and movement they choreographed for themselves and the other young residents reflected their experiences within and outside of the homeless shelter they claimed as their temporary home. Although the shelter was their official residence, the young women of BlackLight conceptualized home to include all of Detroit, and family to mean anyone who lived in the city and was challenged by the same economic struggles they faced as well as the perpetual hurdles of identities marked by factors such as race, gender, age, and color. Tanya was reading a short story written by Rachel, one of the other members of BlackLight, who wrote about how alienated and invisible she felt before she stopped attending high school her junior year. The YouTube video of a Black girl describing her almost paralyzing fear of stepping foot in the classroom was the additional research Tanya used to inform the movement she was choreographing to embody a collective representation of Rachel’s personal narrative of disenfranchisement through the public education system in Detroit. Tanya asked me to help her develop movement inspired by a sentence in Rachel’s story that used the word “love” over six times to talk about what she dreamed school might feel like if she were at the center instead of clinging to the margins of the educational process. I didn’t even know the words “This is how you show love” came out of my mouth until Tanya admonished me with the fact that she, and all of the other young women in Blacklight, already knew how to love. Tanya’s anger was clearly not directed at my awkward method of dance instruction; she wanted me to acknowledge that BlackLight’s work was fundamentally about love and drew its power from the careful attention and thought she and the other young women gave to telling their stories as a way to touch deeper truths that shaped the realities their entire Detroit family moved through on a daily basis. In a few days, Rachel’s story, told through Tanya’s dancing body, would become the opening performance for a community workshop on the state of the public school system in Detroit led by the young women of BlackLight. The BlackLighters bravely revealed their vulnerabilities in the hopes that others might identify a path towards their own liberation. This was love, and they didn’t need me or anyone else to teach them how it should be expressed. The entire time Akira was reading the poem she had just written, her shoulders were raised to her ears and the words flew out in staccato breaths that felt like repeated jabs to the chest. She looked like a boxer bobbing and weaving to the punch of each syllable. The writing prompt Akira was responding to was, “What does it feel like to walk through downtown Newark?” Akira, at fifteen a high school sophomore and self-proclaimed “proud Black girl,” was attempting to convince her BlackLight peers that the only way they could truly comprehend the sentiment behind the interviews they were transcribing was by putting themselves in the place of the interviewees. The young women traded the small cassette tapes back and forth, taking turns listening to Black girls and women describe their experiences moving through public spaces in Newark and, perhaps most importantly, how they felt as they navigated crowded and empty streets, killed time at bus stops, assessed the quickest and safest routes home, and looked out for the well-being of other girls and women as they embarked on similar everyday expeditions. It is significant, however, that in light of these extreme circumstances, the young women’s discussions inevitably circled back to locating the ways in which they could envision themselves as agents for change within these disturbing events. The decision to interview other girls and women emerged from the BlackLight members’ belief that the first step in addressing any difficulty or problem was through the intentional transition from a singular story to collective narrative. The interview process and subsequent translation of the interviews into a multi-media performance that incorporated dance, poetry, and photography was both an artistic cultivation of solidarity and a creatively devised political tool to speak to local officials and other state bodies authorized to protect Newark residents. BlackLight in both Detroit and Newark was a performance project, a dialogical space, a safe gathering, a political intervention, and a form of social justice. BlackLight was also the process through which Black girls used their bodies—the same bodies that were often objects of concern and violation—to protest the terms by which young Black women are hyper-visible as social problems, while they go unseen as powerful social actors. I don’t know where these young women were going or who or what might meet them when they arrived, but I was transfixed by the efficient transformation they made as they discarded their school uniforms, put on new costumes, brushed their hair, drew on eyeliner, laughed with one another, and paid no mind to the flow of women coming in and out of the bathroom irritated by the space they took up and the sinks they made unavailable. Their choreography was synchronized and fluid, as if they had done this a dozen times before, and I could not help but to think of the ways in which all young women manipulate and mobilize their bodies to sometimes transcend and other times disrupt social expectations and the constraints of space and time. I could also not help but wonder how these bathroom transformers thought about community and performed acts of protest in their lives. What would it take, what agreements would have to be in place, and what identities would have to be transgressed for a cultural anthropologist such as myself (who also happens to be a Black woman) to conduct fieldwork with young white women on the Upper West Side? Young Black women are part of a larger imagined, monolithic Black community that has been long established as an appropriate ethnographic site for a host of intersecting reasons that have to do with a sociological obsession with naming supposed social ills and quantifying potential resistance. My research with young Black women in low-income sections of cities scarred by deindustrialization and a neoliberal ethos has fed my interest in revealing the less spectacular examples of protest and social survival. And yet, if I am, and if we are, ultimately interested in social justice beyond theory or its politically correct caché, might we begin from a different frame? What might be revealed if we explored those mundane places we assume we already understand because they have been idealized as our collective norm? As the young women in BlackLight remind us, blindness can be most detrimental when it prevents us from seeing in the places where we assume there is nothing new to see.